Contrary to popular belief, an Irish band can indeed exude R&B soul. The up-and-coming Irish band The Script has the guts of the fighting Irish to put their heart on their sleeve and yet carry a note with force, owning up to years of hard work discovering their Celtic soul, R&B and rock sound. 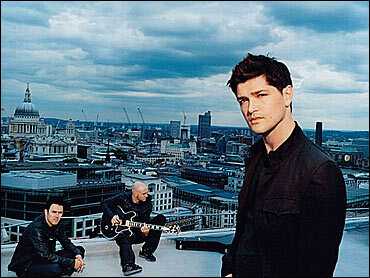 With traces of Maroon 5, John Legend, The Fray, Gavin DeGraw and Jason Mraz, The Script has American influences with an Irish spin. And it's not just the luck of the Irish that has given The Script their time to shine - it's their talent. Fellow Irishman and U2's Bono is a huge fan of The Script. He has given them his seal of approval - one of the greatest endorsements any musician could ever hope for. The Dublin-based trio, made up of Danny O'Donaghue, 25, Mark Sheehan, 27, and Glen Power, 28, stopped by The Early Show Saturday Edition's "Second Cup Café" Saturday to perform songs off of their self-titled debut album, including their hit song, "The Man Who Can't Be Moved." Although The Script can't attribute their funky urban sound to the Ireland they once knew - which had little outside influences - Sheehan pointed out that the country is diversifying today. As young lads, the trio didn't realize that the "fuzzy little channel" called MTV that came on at midnight would someday influence their own music. "It was the first interjection of hip-hop in Ireland," Sheehan said. Although the days of watching the antiquated version of MTV are over, Sheehan said the band is part of something much broader. "We are victims of the Internet generation, who don't stick to just one genre," he said. Not sticking to just one genre has been the key ingredient to their success. Their debut album has been a huge hit overseas, debuting at No. 1 in both the U.K. and Ireland. Surrounded by the hype and mayhem of striving to succeed in Hollywood, the talented trio found their name while living in Los Angeles. "It was something that we coined," Sheehan said. "Instead of, 'What's up?' or 'What's happening?' it was, 'What's the script?'" - referring to scripts that struggling artists would receive in Hollywood. The Script is influenced by a myriad of artists, such as Kanye West, Timbaland, U2, Missy Elliot, Queen, David Grey and The Police. "We are all so versatile," Sheehan said. O'Donaghue was enthralled with the amazing capacity of Stevie Wonder's voice and how he hit every note with such soul. VH1's "Sober House," a reality series spinoff of "Celebrity Rehab with Dr. Drew," has featured The Script's tunes in their episodes, including "Before The Worst," "We Cry," "Breakeven" and "The Man Who Can't Be Moved." Ironically, The Script's recording studio in Ireland isn't located in the ideal spot for rehabbers: It's near the Guinness Brewery, Sheehan pointed out with a chuckle. Besides the comfort of a cold Guinness, the trio found solace in each other as Sheehan sat beside his mother's death bed and later O'Donaghue faced the unexpected death of his father from a heart attack. Being at his mother's bedside, the lyrics just poured out of Sheehan. "The studio became almost like a therapy session," Sheehan said. The Script has gotten a lot of love from Hollywood so far, with airtime on VH1 and, soon, on "The Hills." Celebrity gossip blogger Perez Hilton even showed up while they were filming one of their upcoming videos. With the Grammys around the corner, the talented trio is rooting for U.K. artist Adele, who's nominated for Record Of The Year, Song Of The Year (both for "Chasing Pavements"), Best New Artist and Best Female Pop Vocal Performance. "We hope to see new artists flourish," Sheehan said. There have been rumors flying around that the band will team up with U.K. performer Leona Lewis. Although they're staying in the same apartment complex as Lewis and are friendly with her, there hasn't been anything officially written just yet, band members say. Fans of The Script can grab a pint and a copy of their self-titled debut album in the U.S. on St. Patrick's Day, March 17.